MPEmbed now has a snapshot button that can be enabled in MPEmbed Premium. When clicked, you will be able to select output format including multiple resolutions at 4:3 and 16:9. 4096 x 2048 Equirectagular spheres can also be exported using the snapshot button. Filters are not applied to the snapshots. The blue circle cursor that appears while you are navigating the space will, unfortunately, appear in your snapshot too. As this functionality is a direct application of the Matterport SDK, I am imagining that this will be resolved soon when the next feature roll-out comes to Workshop 3 (Snapshots, Measurements, 3D Paths). Take Snapshots and Export Panoramas with MPEmbed! MPEmbed can now export snapshots in 4:3 and 16:9 and various resolutions! Are you one of 'those' MSPs who use snapshots for your MLS pictures and want 4:3? You're covered!You can also quickly export panoramas to post to Facebook. You're limited to 4096 x 2048 (sorry about that).Just enable the snapshots button under 'Main Features'. You can even let visitors to your MPEmbed Space take snapshots too! How cool is that? You can now sort the content in the highlight panel as well as disable individual highlights. Sorting includes space thumbnails and joined highlight reels. This feature provides some customization that may prove handy if you are using both a highlight reel and the highlight panel for different purposes. 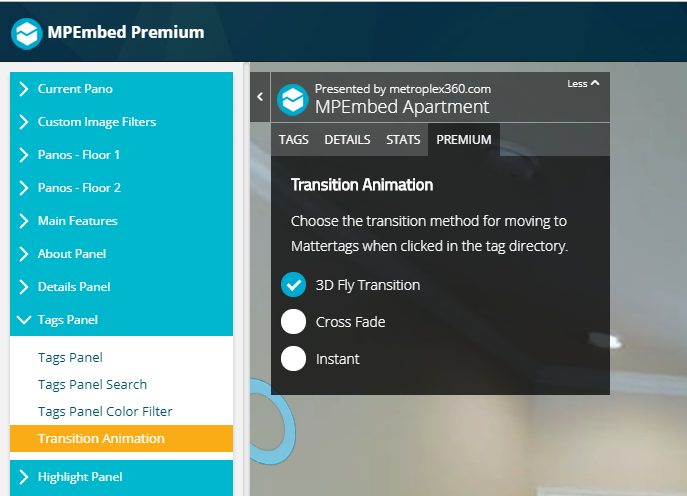 You can now pick if you would like to ‘Fly’ between Mattertags, ‘Cross Fade’ or ‘Instantly Transition’ when using the Mattertag Panel and mini map to navigate. Thanks, Showcase SDK 3.0.6! This ‘experimental’ feature is now available to use for all spaces. Previously, hiding / redisplaying Mattertags would cause embedded multimedia content to be stripped from the tags. As of Showcase 3.0.6, this has been resolved and the feature has been moved into the ‘Tags Panel’ box. It’s a great tool if you have a ‘scavenger hunt’ style tour and don’t want people to see the locations of your tags while in 3D mode! It can also make your space much cleaner if you have a massive number of mattertags! Speaking of measurements — there’s a bug with 3D Measurements related to the Showcase platform. After displaying 3D Measurements and then moving, they will disappear and cannot be displayed again until restarting the tour. The bug is likely due to a change in the data format between Workshop 2 and Workshop 3 and may be the reason that the public Workshop 3 roll-out did not include the Measurements feature. On a positive note, 3D Measurements on the mini-map (that display as 2D) are now working correctly on multi-floor spaces and will appear and disappear as you swap floors. The code that handles the minimap shifting between floors has been rewritten to properly identify which floor things belong on. 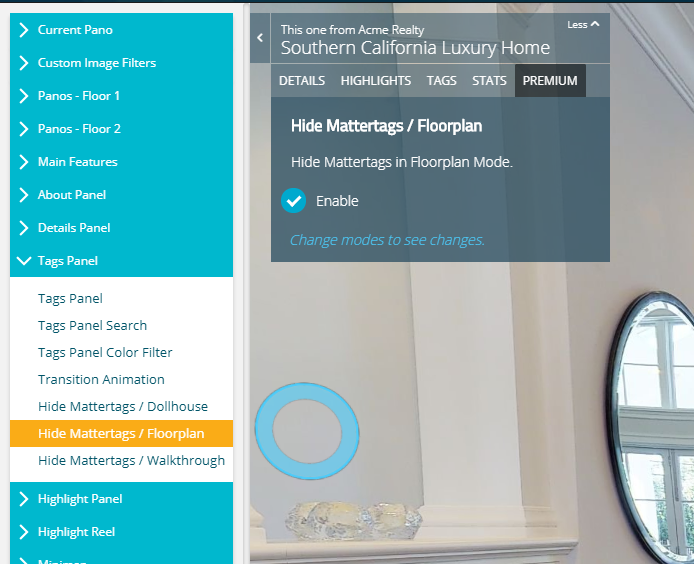 The SDK identifies the floors that panoramas and labels belong to, but not Mattertags or measurements.